As one gal said. "Sugar cookies transcend political lines." I hate politics. Really. I know what I want in a candidate, but I am not likely to argue any points with you. If we're Facebook friends and you post about anything political, chances are you are hidden. Not unfriended, but out of sight. So if you're wondering why I didn't say congrats on your new baby, marriage or trip around the globe, it's because I don't read your feeds. So last week one of my oldest friends, (20 years) invited us to a "meet the candidate" at her house. I wouldn't pass up a soiree at her house for anything, and I used it as a reason to mix up a little red, white and blue royal icing. The candidate is running for Alderman. I really am not even clear what an Alderman does, but we live in a nice little burg, and Democrat or Republican, at this level, they are all working for the same thing. He was a really nice guy. He is obviously an amazing decision maker, as his wife ia a fellow Iowan, and he loved his cookies. It was a fun gathering, and I felt rather civic when all was said and done. So, get out there and vote! It's that time of year! It used to be the days of buying Crayola's and glue sticks, but we have moved on to Greek everything! The first wave was last year after my daughter and all her friends pledged at their various schools. This year, they are on the other side and have "little sisters" and duties of an upperclassman. 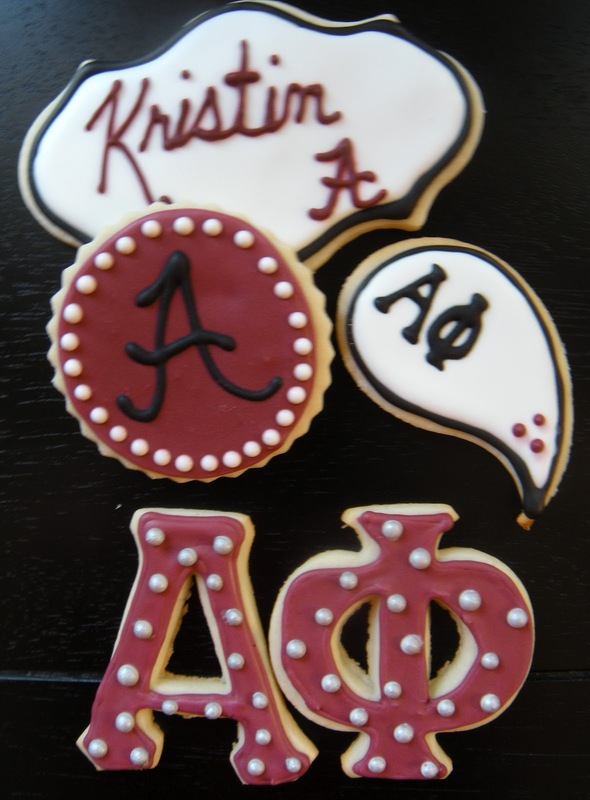 Regardless, it is a fun way to spend your college years, and here are some cookies celebrating many sisterhoods! Remember that First Birthday? I do, for both my kids. It seems so special, such a milestone, so very long ago. When I was asked to help celebrate Arden's First Birthday, I said YES! Her mom waited a very long time for a baby, and she is a special little girl. Her mom wanted SugarBelles blue birds. So, knowing exactly the cookies she spoke of, I emailed SugarBelle and asked her if I could pretty please copy her cookies. Like the majority of cookiers, she said yes. She is a great artist, and her blog is full of inspiration, clever ideas, tips and tricks, and she truly loves to share and help us all along to become better at our craft! Thanks SugarBelle....and Happy Birthday Arden! Here's to many more! 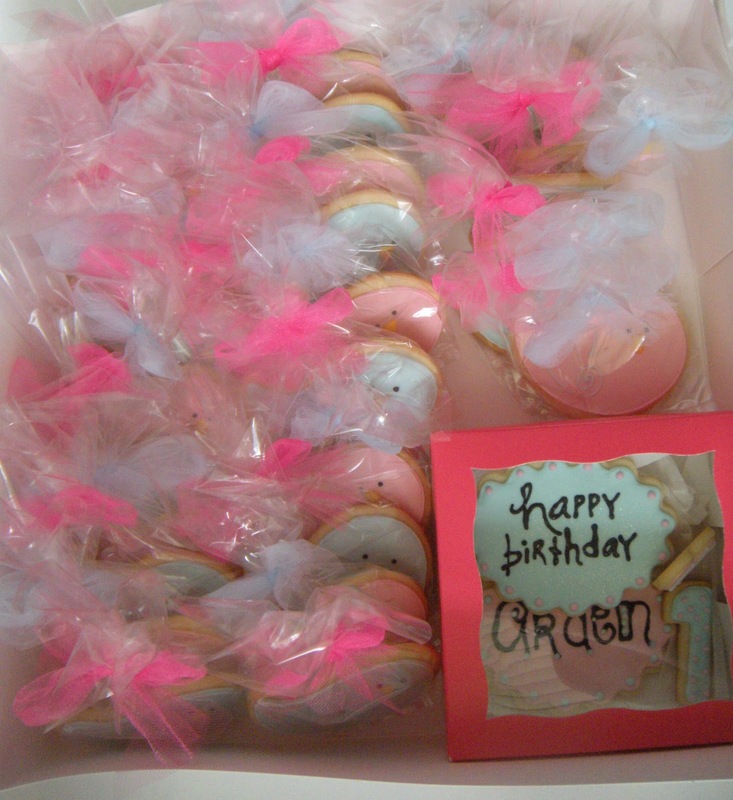 So back in June, I did some birthday candle cookies for my daughter's bestie. They were darn cute and I referenced Maryann the Cookie Artisan who has the most impressive Flickr stream ever. Honest. 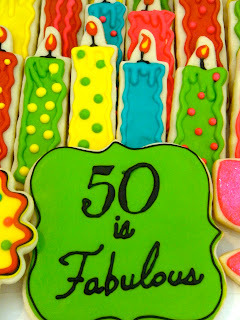 She is an artist with royal icing, and her 40th birthday platter was my inspiration. I had the pleasure of meeting her at Spring Fling for cookie people in Louisville, and she is the kind of person you wished lived on your block, was on your PTA, hung out at your family reunions...high energy and genuinely nice, besides her kick a** cookies! She did an entire session on creating platters and shared many of her stunning creations with us. She has an artist's eye, and she helped us find that. I love making platters for my family, my co workers, friend' birthdays, kid's showers, holidays, their graduations, First Communions, and even sports teams. Truly, that hour with Maryann and her slide show taught me a lot! 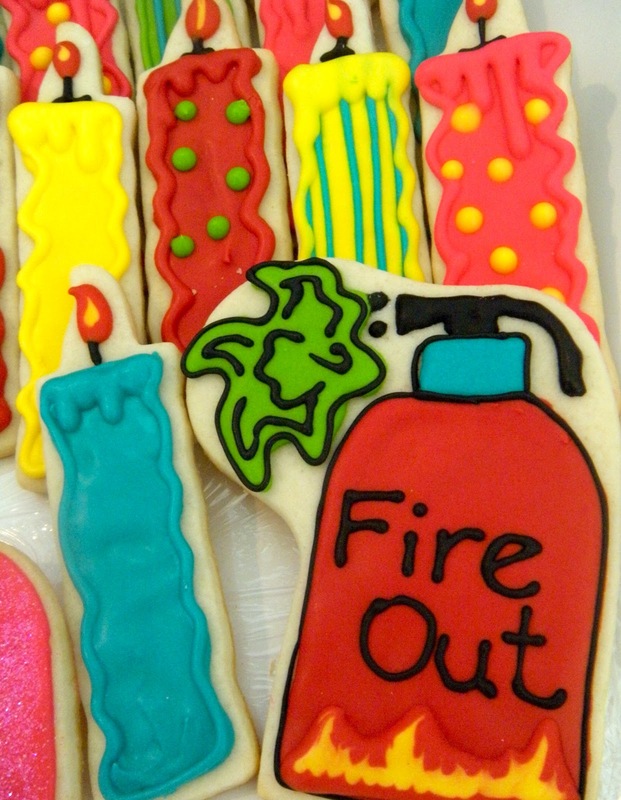 Her platter of 40 birthday candles and the fire extinguisher has been copied many times. I couldn't resist. The only other thing I could think of making 50 of for my friend Denice, was dresses, as she is a clothes horse. And I mean that in the nicest way. She dresses impeccably, and has dressed me well as of late too! But I thought the birthday candles would be great. 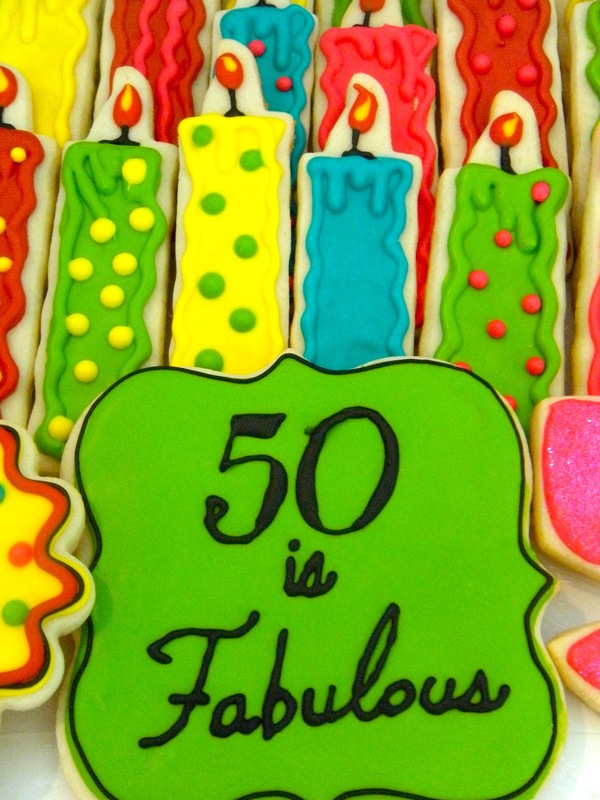 They are a great eating size, fun to decorate, and 50 makes a stunning platter! So Happy Birthday to Denice and many thanks to MaryAnn. So everyone knows I make sugar cookies. Chances are if we're friends, and there is an event in your life, and my life is not crazy out of control, there's a good chance you'll get cookies. 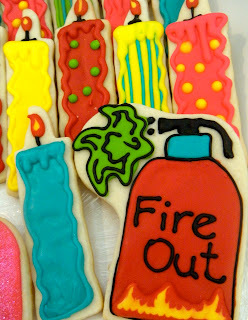 My crazy little brain thinks up all kinds of kooky cookie ideas, but there really aren't enough days in the year! 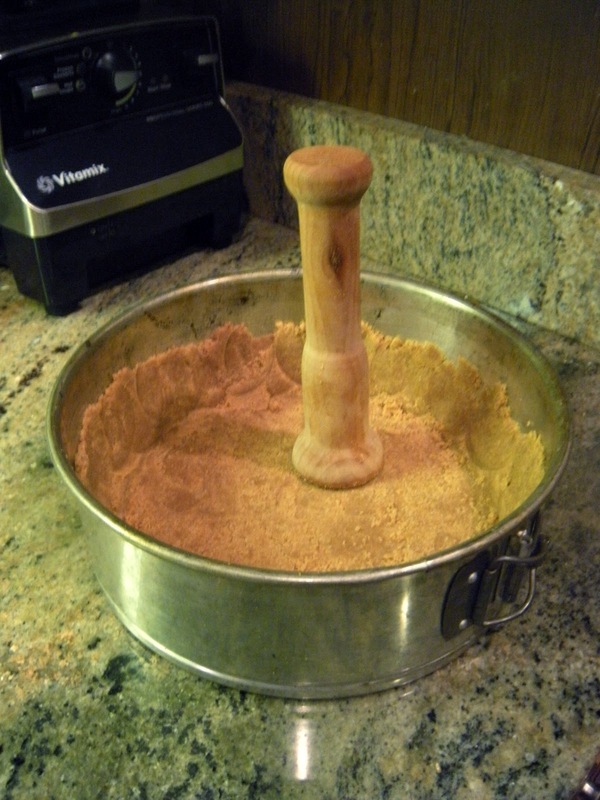 However, not everyone thinks I am all that and a bag of chips...I did a blog awhile back called The Cobbler Kid's Brownies when my family was feeling left out of the sweet rotation. So this week I baked up some Superhero sugar cookies for an event at the store to benefit Share Our Strength. A mission to end childhood hunger right here, where we all live. 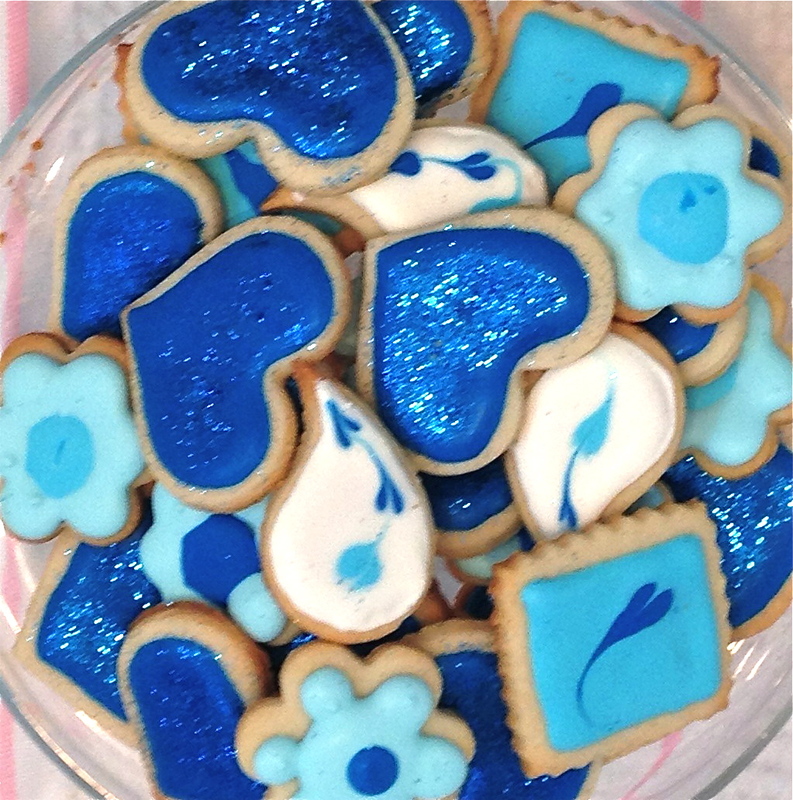 For a small donation, a child could decorate and take home a couple of superhero cookies. So Nic decided, that would be the only way he was going to get his hands on my cookies. Ha Ha. But if he wants to come at the end of the allotted time and buy up whats left, I say more power to ya, and more to Share Our Strength. Happily, my children have no idea what hunger is. But as the summer winds down, and my oldest (Nic) is having his "last" of everything before he heads back to the barrens of Oklahoma, he begged me to make his kind of sugar cookies. 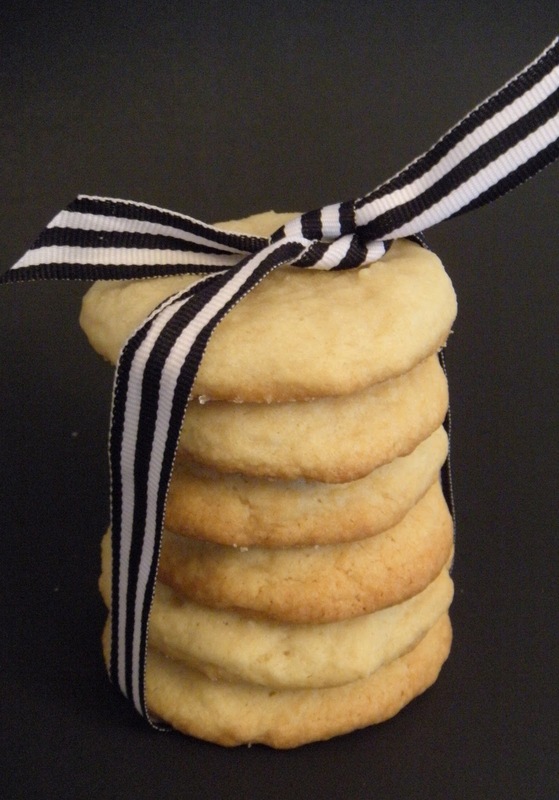 He Googled, "Grocery Store Sugar Cookies" and found these by Gale Gand. She is a pretty accomplished chef, and she may not be crazy that her cookies fit the grocery store description, but they are far superior to them, I promise! I followed the recipe exactly, and he was the happiest kid ever. 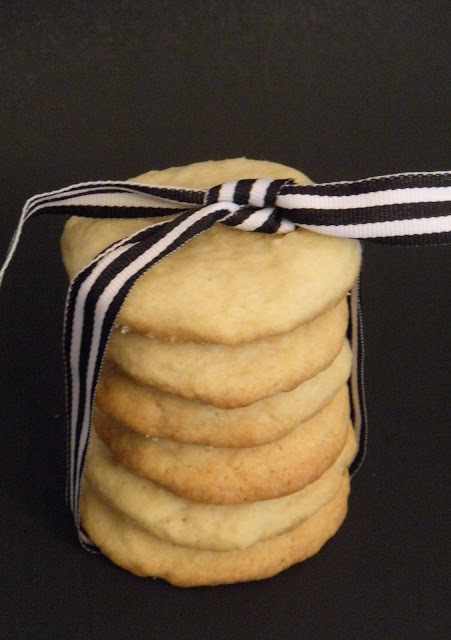 Soft, chewy sugar cookies with a little sugar crust on the outside. These aren't my kind of cookie, those are in the fridge begging to be baked up tomorrow and blogged. Cookies chock full of "stuff". But today, it is all about Nic. So here's the recipe, and if a crispy sugar cookie with royal icing isn't what you want, these softies will fit the bill. So, what are you waiting for? Get in there and bake! Place all dry ingredients together in bowl. In mixer, beat sugar and butter until fluffy. Add vanilla and egg. Add dry ingredients, and enough buttermilk to bring it together without being too wet. Place large mounds, flattened slightly on lined cookie sheets and sprinkle a little sugar on top of each cookie. Bake at 375 for about 9 minutes. The edges should be golden brown. Cool on a rack before moving them off cookie sheet. Makes about 3 dozen cookies. When I got this month's assignment for the Secret Recipe Club, I was so excited. Delishhh is an amazing blog written by Ewa. She is born in Sweden, raised in Asia and currently lives in one of my favorite cities, Seattle. I knew her blog would be full of cool stuff, but I wanted to make something Swedish. So I decided on Jordgubbstårta. Which is a Swedish strawberry birthday cake. I am hoping I didn't butcher the spelling with that little "a" I inserted! But wait! I thought this cake would be a light dessert for one of those last family meals before my kids head back to college and my nest is empty again. But no. My kids asked what was for dessert and I told them it was SRC, and they said they would look for something for dessert. Lucky for us, Ewa likes to bake (and not bake!) and after looking at every blog post, my kids unanimously decided we were having No Bake Nutella Cheesecake. Who can argue with that? 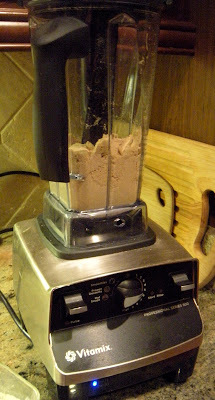 Crush crackers in a food processor or blender until fine crumbs. Add melted butter and pulse until moistened. Dump into 8" Springform pan and press up sides. Chill while you make the filling. In a mixing bowl, beat cream cheese, powdered sugar and vanilla until smooth. 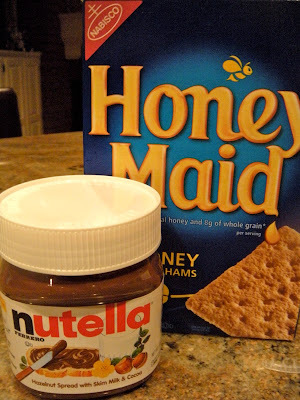 Add the Nutella and beat until incorporated and then mix in the whipping cream. Dollop into the prepared crust and chill for at least 4 hours. Ewa crushed some Ferro Rocher chocolate candies on her cheesecake. We just topped it with whipped cream. This is rich and decadent and super fast to boot! So the summer is winding down, and the end of July was sooo busy. 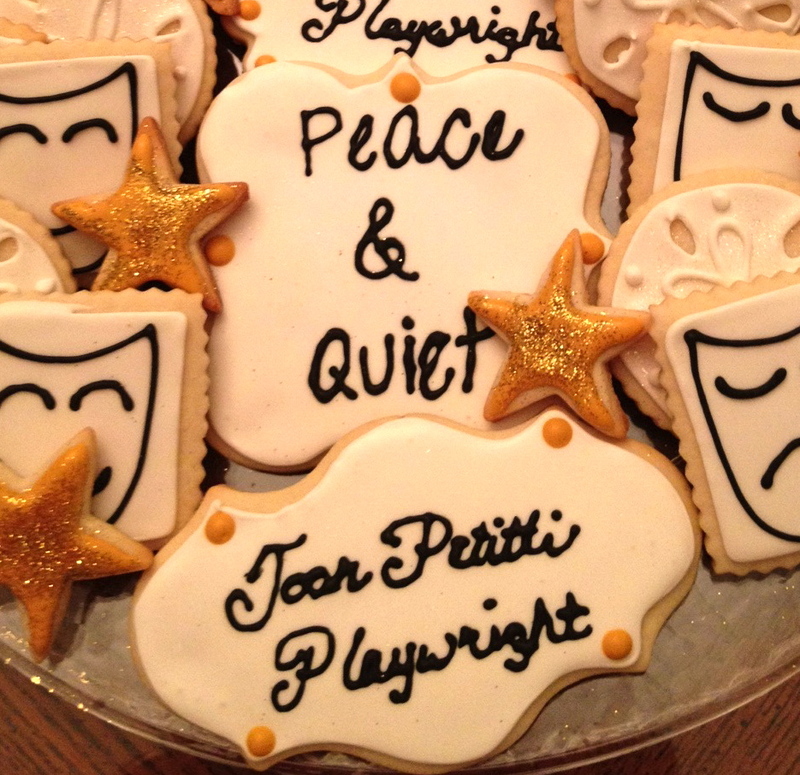 The whirlwind started in Florida, and my mom's play Peace and Quiet being produced at a theater in Florida. It was a One Act Play Festival, and this was her second play produced. My sister and I headed down to see the production. We were not disappointed! 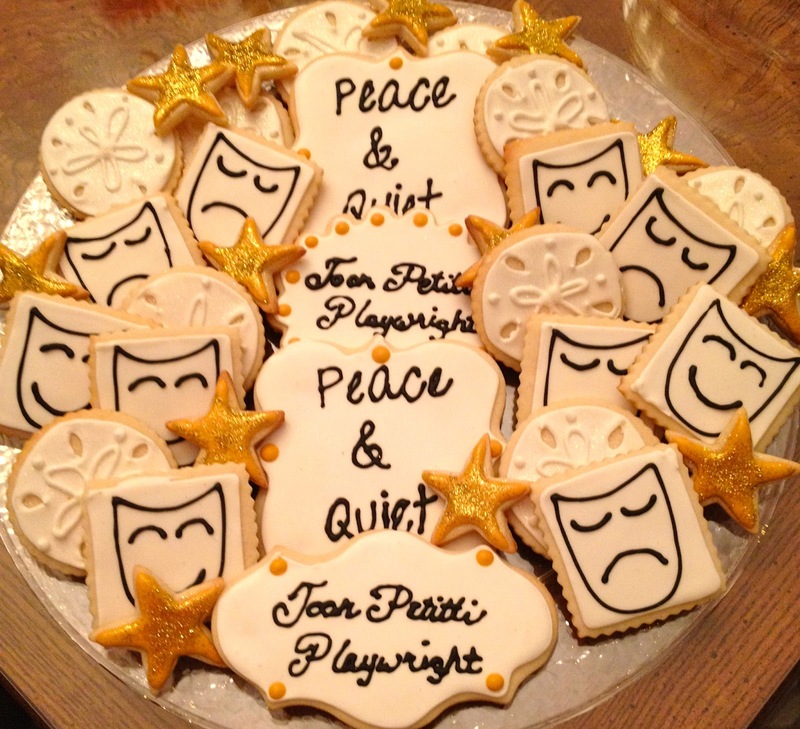 The One Act Play Festival featured ten, one act plays. Needless to say, my mom's was my favorite! One night before the plays, we met up with about 27 of her friends for dinner, then off to the plays, and then to the house for a party. I hand carried these cookies for the party and everyone loved them! The best part of the festival? Well, I was inspired. I have always written (hence the blog), and I had a play just itching to be written. So I did. My first play. I am getting ready to send it out, with the help of the best playwright I know! Thanks Mom! So who knows, maybe I'll be the next one to have my name in the Playbill! These cookies, were just little nibblers that I brought for my parents. 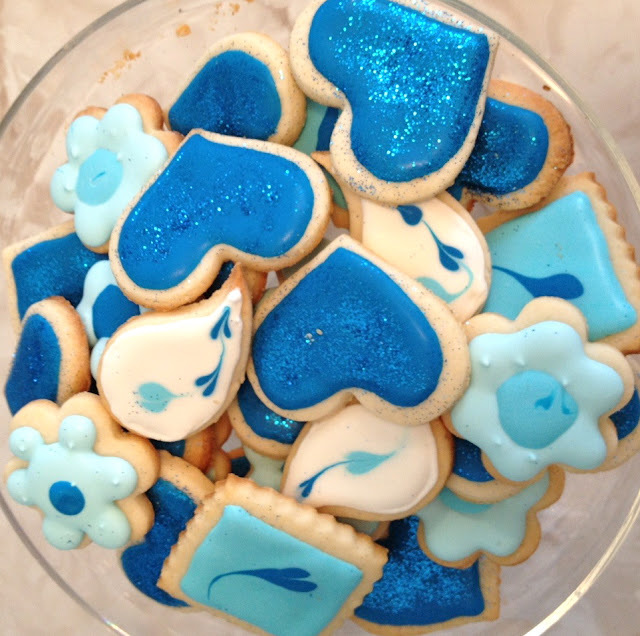 They loved my little 4th of July cookies, so I thought I would go with that little idea and make various shades of blue. 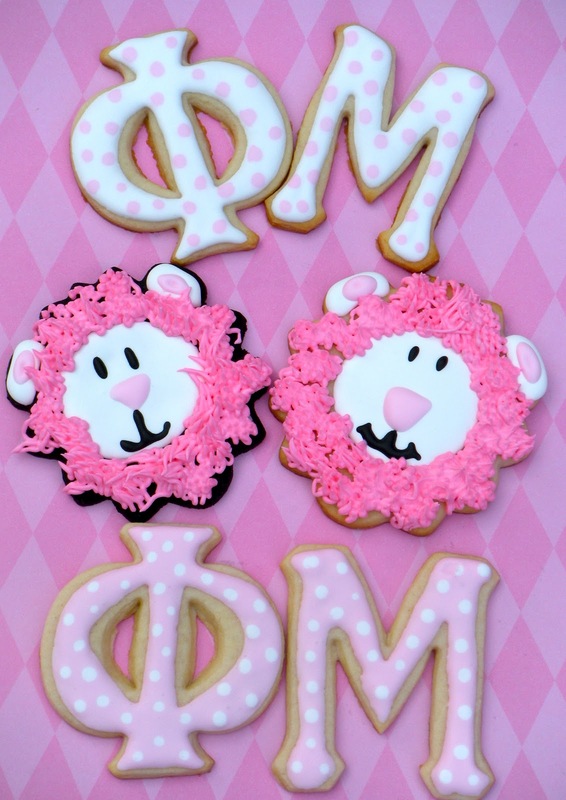 They turned out pretty cute too! So, what are you waiting for? Get in there and bake!